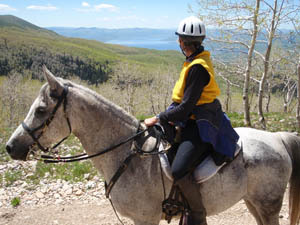 You never quite know, when you climb on a horse for the first time 5 minutes before the start of a 50-mile endurance ride, what you will be in for. Is he going to run off with me or dump me? I REALLY don't want to get hurt. Will we get along, or will we be fighting all day - is it going to be fun or miserable? And what about the horse? I REALLY don't want to tie up or colic or hurt someone else's horse. By the same token, someone who loans you one of their horses to ride that you get on 5 minutes before you leave the starting line, never knows how you and their horse are going to get along, or what they are going to have left at the finish. And so it was, that just before the start of Day 1's 55-mile ride I climbed on Sue's horse Amazing Khan for the first time, to take him through only his second endurance ride. "He gets a bit excited," Sue said, "but nothing bad." We were letting most everybody go ahead of us because we were going to hang out a pie plate showing the way on Day 2, after all the riders had passed today's turn off. That was probably good for me, so my horse wouldn't have a pile of horses and riders to deal with around the start and down the trail. Khan, a kind white gelding with pink-rimmed eyes and mouth, (Sue said, "I hate pink horses!" 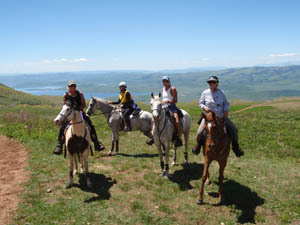 They sunburn so easily, especially at these high altitudes) was quite calm as we saddled up, though he was shaking a bit. 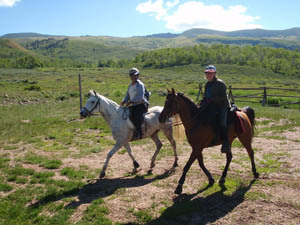 When I hit the saddle, he started jigging as we made our way to the start, behind Sue and her horse Al. It was a nervous jig... but, hallelujah, that's all he did. He never pulled hard or threw his head up or down or bucked. Only a few times on the first loop did he pull and hang on the bit, but I got him off of it with little effort. It was quite the technical trail we traveled on through the fir and aspen forest on the west side above the Strawberry valley. Twisting, turning, up and down, over tree trunks and branches, around rocks, by boggy beaver ponds that are ever-oozing outward, sometimes muddy, sometimes rocky. You needed an athlete for this ride, not a torpid stumblebum. Fortunately Khan was very balanced, and not intimidated by anything - nothing better than a competent, confident, forward moving horse! What a treat - we were a perfect match! A few miles out, we met a rider coming back. Linda Fisher said she'd broken a rib or two: "I can't ride 50 miles like this!" 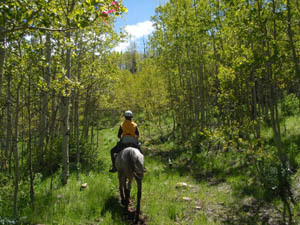 Riding must have felt better than walking, though, because she was still on her horse as she headed back to camp. We crossed the little Strawberry River (more like a 'crick') and crossed to the other side of the valley. 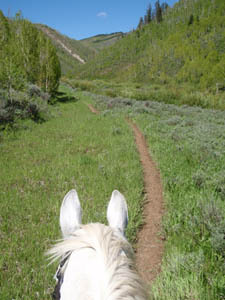 The trail we followed led through a hillside covered with sagebrush, mules ears, and strawberry plants which, in the fall, must be an oral paradise for humans and animals alike! We caught up with Mark Wood and Dave Rabe as we entered an aspen forest. Here were a couple of Real Endurance Riders. Mark has 15,000 AERC miles, and Dave has 45,000 miles - ! Dave is always pleasant and always has a good time - rain, snow, sleet, hail, hurricane or sunshine - and he's always wearing shorts. Never wears tights. Wouldn't be caught dead in them. Only once or twice has he been spotted wearing jeans on horseback, and that was for an Easy Boot ad. I've known Dave a long time and have never seen him in anything but shorts and tank top (maybe a long-sleeved shirt under the tank top, if it's really cold, or a raincoat if it's snowing or raining), so it's normal to me, but several people here who didn't know Dave were awed by it. (It IS awesome, when you're wearing 4 layers and Dave's in shorts and a tank top and he's not frozen.) All I know is that if I DID see him in anything other than shorts, I'd be suspicious or worried. Many parts of the Strawberry Fields trails we went through were muddy, soft and squishy. Here I followed Sue across a squishy field, and just behind us, crossing in the same spot, Dave and his horse went down in a bog. And here is where I remembered that I have TWO fears in endurance riding: LIGHTNING, and BOGS. Dave immediately leaped off and was able to quickly get his horse out (he didn't go down far), but I had the Willies for the rest of the ride any time we went over squishy places... which was too often for my comfort level. We got to the pulse down and trot-by stop in the next valley (which would be the lunch vet check after a big loop), and we waited there till all the riders on the 50 had come through. Khan kept his head buried in food the whole time. Loop 2 took us up Co-op Creek, climbing and climbing in the forest, along a staircase of beaver ponds and dams, to the aptly named Beaver Junction (where we hung the pie plate and changed ribbons for tomorrow), up onto logging roads, still slowly climbing, up to 10,000'. The aspen forest was spectacular - gold, yellow, lime green leaves against the clear blue sky. Bright sunshine, cool breeze - it was perfect! Our horses were trotting along easily, Khan enjoying being in front, me enjoying being in front on a strong forward horse that didn't spook at anything. Sue was fascinated with all the carvings on the aspens. Aspen trees in the Hoover Wilderness of the high Sierras in California have carvings from the late 1800s from Basque sheepherders; these carvings were mostly from the 1970's to now, though there were a couple from the 1950's. Mostly it was just names, but there were some pretty outrageous carvings, some artistic, some a bit naughty! There was one Russell Whitehorse who left his carved name everywhere, one of them with a carved horse head. 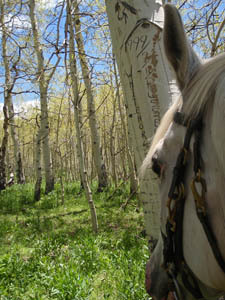 I got off and put my white horse by the carved white horse on the white aspen tree, left by Russell Whitehorse, and took a picture. We caught up with Dave and Mark again, and with Carla Richardson from Colorado. We all leapfrogged for several miles through the forest. Rounding a corner high on a logging road, I was unprepared for the stunning sight of Strawberry Reservoir about 2500' below us. We had a great view of mountain ranges in the distance, the closest being the Wasatch range, and we heard a fox call from underneath cliffs by a dried up pond. Our logging road then turned down, gradually downward for miles, out onto a winding trail through the sagebrush in the valley that led us to the vet check. We were there for an hour, and Khan did not lift his head ONCE from all the horse food: grass (which we'd been snatching from all along the trail), hay, alfalfa, grain, carrots, apples. That's what you like to see in an endurance horse - a good eater! I had to peel him away from the grain buckets as we headed out on our final loop back to camp and the finish. We crossed over the boggy area again without mishap - Sue flagging a different way around it for tomorrow's trail - following Bjorkman road up and up again along a creek. Parts of the trail were quite muddy from yesterday's rain, but Khan and Al had no trouble with it. Then suddenly - we were descending the last half mile into camp. It was 5:00, but the day had flown swiftly by, under my horse's fleet and sure feet. A great day for just about everybody. 56 of 58 finished the 55 miler, and 28 of 29 finished the 25 miler. 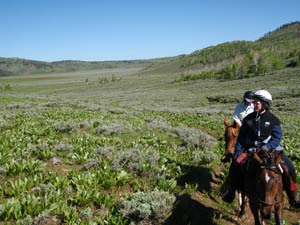 The endurance riding Bradley family cooked dinner for everybody - salad and lasagna, just the thing to hit the spot after a day of frolicking on horseback with my new pal Khan in the Utah mountains. Just an excellent day all around.